This is the eleventh in the needlework series. Betsy Devonshire owns Crewel World, a needle working shop she inherited from her sister after her sister was killed, thus beginning Betsy's trek into sleuthing. Betsy seems to just put the pieces together after talking with people and gleaming information. She doesn't even have to talk to the killer as evidenced in this latest mystery. She does at the end, but I'm getting ahead of myself. Betsy's best friend, Jill, invites Betsy to go horseback riding. Everything starts off good, until something spooks Betsy's horse and Betsy gets thrown from the mare and breaks her ankle. But life goes on and someone needs to run the store. Her faithful employee, Godwin DuLac, steps in to help run the store and even goes to the EGA (Embroiders' Guild of America) luncheon in Betsy's place. This proves to be more interesting than originally expected. It seems Bob Germaine, who accepted a $24K check for the Heart Foundation raised by the EGA has disappeared along with the check. That very same night, Tony Milan is hit by a drunk driver and ends up in the hospital with a few bad breaks, but the worst news Tony has is he can't figure out what happened to the check he planned on stealing from Bob Germaine. Days later, Allie Germaine, Bob's wife, approaches Betsy and enlists Betsy's help to locate her husband and hopefully clear his name. Betsy pointedly lets Allie know there's very little she can do with a broken ankle. Allier persist and gives the best argument why drugs (even prescribed ones) are bad for people. Betsy finally relents and says she'll make some calls and do what she can. Goddy meets with Betsy later and begs Betsy to let Goddy help her in this case. Betsy's become something of an idol for him and he's just enamored with her sleuthing skills. Betsy, still under the influence and broken down by Allie's insistence, she agrees to let Goddy help her investigate. I smell an Afternoon Special in this story. Later, Goddy confirms his suspicion that Bob's gay when Goddy's gaydar went off during the banquet. Betsy eventually points out the holes in Goddy's detecting skills and she and Jill coach Goddy on the proper way to interview people and gleam information without really trying. Armed with this new knowledge and a pretty notebook, Goddy sets forth to get more information for Betsy. Meanwhile, Bob Germaine's body's found in a car at the airport. More questions abound. In the interim, Betsy acquires a new houseguest, a crow. Crows are smart. Real smart, and conniving, too. Let the crow do your accounts, but count the money at the end of the day. Meanwhile, Tony Milan is suffering with a broken leg and arm and his life in shambles. He's been fired from his job due to his stealing, unable to close his account with stolen money due to his rudeness, his apartment in smoke due to his negligence during cooking, and missing his money and ticket out of the states due to his predicament. But none of it's his fault and karma doesn't exist. Even non-believers are not safe from karma. I don't feel sorry for Tony and his luck is going to get worse. I really like this series. Unlike most craft series, this one runs the gambit on all types of needlework: cross-stitch, knitting, crocheting and several others I can't recall or do anyway. I can only cross-stitch at this point and have no desire to do any of the others. Occasionally, the characters drool over technique, patterns, and floss, but it all boils down to the crime Betsy's handling at the moment, which involves needlework in body or spirit. What really touched me was the cat in the story. Sophie is the cat Betsy inherited along with the store and apartment after her sister's death. Sophie kind of resents Betsy because Betsy tried to put her on a diet in the first or second book. Betsy since learned to let Sophie think Betsy disapproves of the snacks visitors sneak the cat. It keeps the peace in the family. In this book, Sophie tries to comfort Betsy by sticking close to her side. When I sprained my ankle many years ago, the vicious cat we had took pity on me and laid by my side. 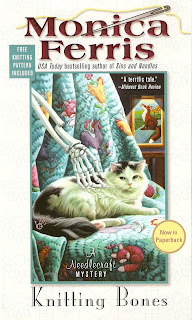 This book reminds me of those times and reinforces how animals can feel our pain and relate their sympathetic nature. Of course, they'll revert to their wily ways once the person they seek to soothe is well again, but take comfort where it can be found, I say. That would be interesting. The Zombie Who Killed Me or Who Killed the Zombie? Hmmm... sounds like a story in the making. Ferris has all her titles tie in with needle-making of some kind. I guess Coming Undone. (groans). That seams sew bad. I've read all the books in this series and I liked them all, except this one.